Access to groups and applications for employees and guests changes over time. 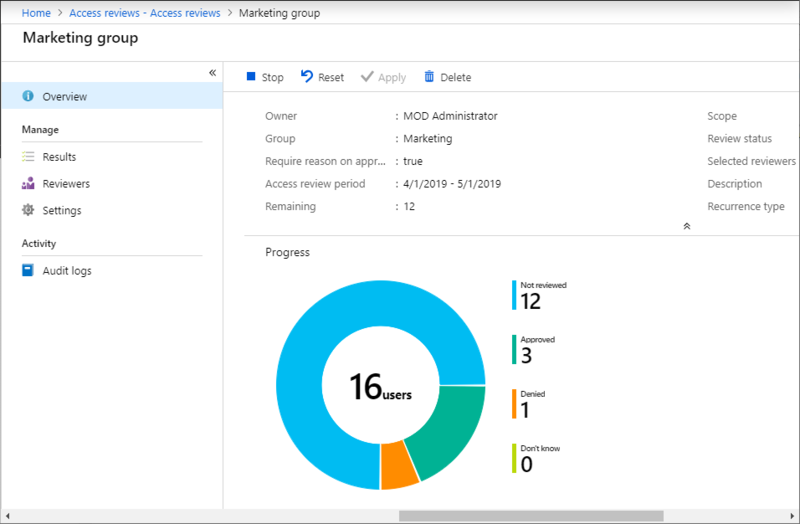 To reduce the risk associated with stale access assignments, administrators can use Azure Active Directory (Azure AD) to create access reviews for group members or application access. If you need to routinely review access, you can also create recurring access reviews. For more information about these scenarios, see Manage user access and Manage guest access. 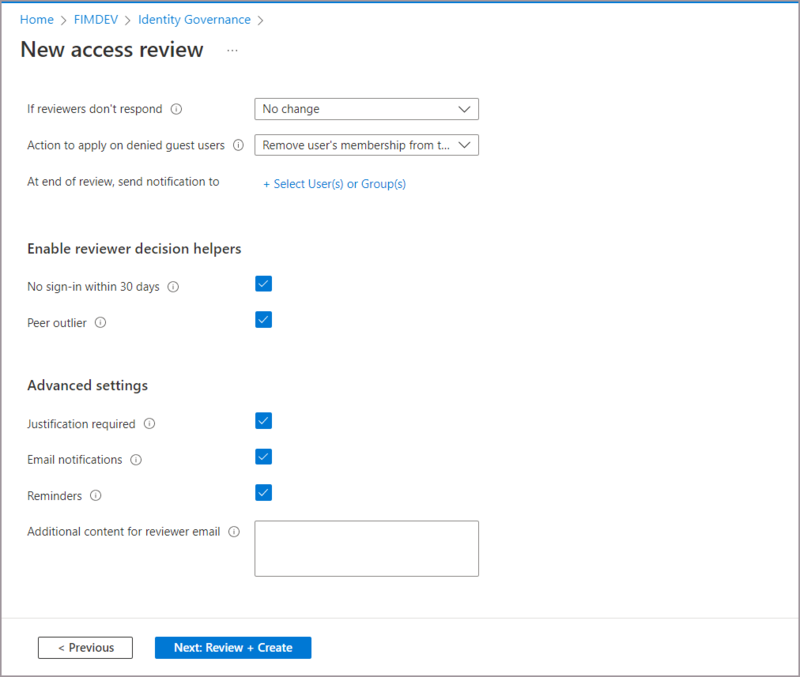 This article describes how to create one or more access reviews for group members or application access. Sign in to the Azure portal and open the Access reviews page. In the left menu, click Access reviews. Click New access review to create a new access review. Name the access review. Optionally, give the review a description. The name and description are shown to the reviewers. Set the Start date. By default, an access review occurs once, starts the same time it's created, and it ends in one month. You can change the start and end dates to have an access review start in the future and last however many days you want. To make the access review recurring, change the Frequency setting from One time to Weekly, Monthly, Quarterly or Annually. Use the Duration slider or text box to define how many days each review of the recurring series will be open for input from reviewers. For example, the maximum duration that you can set for a monthly review is 27 days, to avoid overlapping reviews. Use the End setting to specify how to end the recurring access review series. The series can end in three ways: it runs continuously to start reviews indefinitely, until a specific date, or after a defined number of occurrences has been completed. You, another User administrator, or another Global administrator can stop the series after creation by changing the date in Settings, so that it ends on that date. In the Users section, specify the users that the access review applies to. Access reviews can be for the members of a group or for users who were assigned to an application. You can further scope the access review to review only the guest users who are members (or assigned to the application), rather than reviewing all the users who are members or who have access to the application. In the Group section, select one or more groups that you would like to review membership of. Selecting more than one group will create multiple access reviews. For example, selecting five groups will create five separate access reviews. In the Applications section (if you selected Assigned to an application in step 8), select the applications that you would like to review access to. Selecting more than one application will create multiple access reviews. For example, selecting five applications will create five separate access reviews. In the Reviewers section, select either one or more people to review all the users in scope. Or you can select to have the members review their own access. If the resource is a group, you can ask the group owners to review. You also can require that the reviewers supply a reason when they approve access. In the Programs section, select the program you want to use. You can simplify how to track and collect access reviews for different purposes by organizing them into programs. Default Program is always present, or you can create a different program. For example, you can choose to have one program for each compliance initiative or business goal. To specify what happens after a review completes, expand the Upon completion settings section. If you want to automatically remove access for users that were denied, set Auto apply results to resource to Enable. If you want to manually apply the results when the review completes, set the switch to Disable. Use the Should reviewer not respond list to specify what happens for users that are not reviewed by the reviewer within the review period. This setting does not impact users who have been reviewed by the reviewers manually. If the final reviewer's decision is Deny, then the user's access will be removed. To specify additional settings, expand the Advanced settings section. Set Show recommendations to Enable to show the reviewers the system recommendations based the user's access information. Set Require reason on approval to Enable to require the reviewer to supply a reason for approval. Set Mail notifications to Enable to have Azure AD send email notifications to reviewers when an access review starts, and to administrators when a review completes. Set Reminders to Enable to have Azure AD send reminders of access reviews in progress to reviewers who have not completed their review. Once you have specified the settings for an access review, click Start. The access review will appear in your list with an indicator of its status. 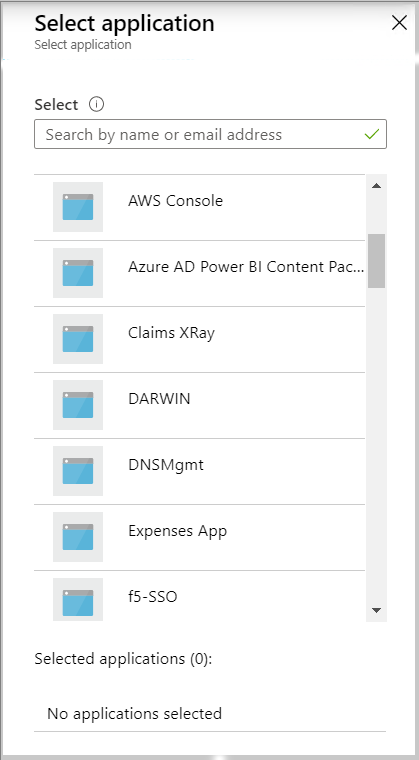 By default, Azure AD sends an email to reviewers shortly after the review starts. If you choose not to have Azure AD send the email, be sure to inform the reviewers that an access review is waiting for them to complete. 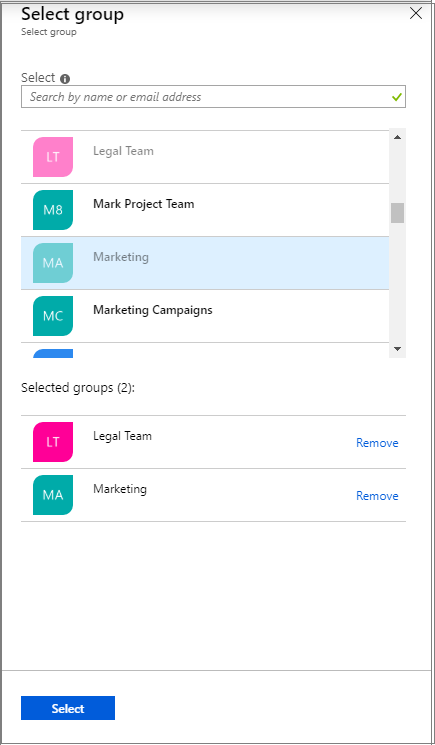 You can show them the instructions for how to review access to groups or applications. If your review is for guests to review their own access, show them the instructions for how to review access for yourself to groups or applications. If some of the reviewers are guests, guests are notified via email only if they've already accepted their invitation. You can track the progress as the reviewers complete their reviews on the Overview page of the access review. No access rights are changed in the directory until the review is completed. If this is a one-time review, then after the access review period is over or the administrator stops the access review, follow the steps in Complete an access review of groups or applications to see and apply the results. To manage a series of access reviews, navigate to the access review, and you will find upcoming occurrences in Scheduled reviews, and edit the end date or add/remove reviewers accordingly. Based on your selections in Upon completion settings, auto-apply will be executed after the review's end date or when you manually stop the review. The status of the review will change from Completed through intermediate states such as Applying and finally to state Applied. You should expect to see denied users, if any, being removed from the group membership or application assignment in a few minutes. You can also create access reviews using APIs. What you do to manage access reviews of groups and application users in the Azure portal can also be done using Microsoft Graph APIs. For more information, see the Azure AD access reviews API reference. For a code sample, see Example of retrieving Azure AD access reviews via Microsoft Graph.